The double bass, also known as the standup bass, is the largest and lowest pitched bowed string instrument used in the modern symphony orchestra. It is used extensively in Western classical music as a standard member of the string section of symphony orchestras and smaller string ensembles. In addition, it is used in other genres such as jazz, blues, rock and roll, psychobilly, rockabilly, and bluegrass. As with many other string instruments, the double bass is played with a bow (arco) or by plucking the strings (pizzicato). The double bass is generally regarded as the only modern descendant of the viola da gamba family of instruments, a family which originated in Europe in the fifteenth century. As such, it can be described as a "bass viol." Before the twentieth century, many double basses had only three strings, in contrast to the five to six strings typical of instruments in the viola da gamba family or the four strings of instruments in the violin family. The double bass' proportions are dissimilar to those of the violin. For example, it is deeper (the distance from top to back is proportionally much greater than the violin). In addition, while the violin has bulging shoulders, most double basses have shoulders carved with a more acute slope, like members of the viola da gamba family. 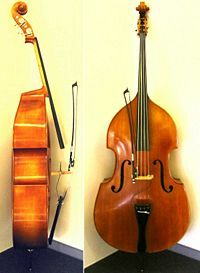 Many very old double basses have had their shoulders cut or sloped to aid the performance of modern musical techniques. Before these modifications, the design of their shoulders was closer to instruments of the violin family. Unlike the rest of the violin family, the double bass still can be considered partly derived from the viol family of instruments, in particular the violone, the bass member of the viol family. Lack of standardization in design means that one double bass can sound and look very different from another. The sound and tone of the double bass is distinct from that of the fretted bass guitar and is similar to a cello. The differences in sound come from several sources which are discussed below. 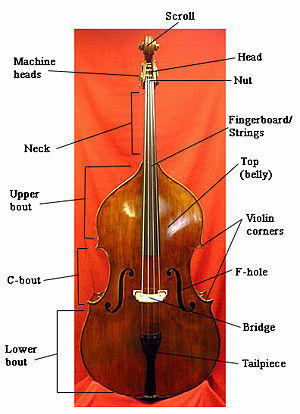 The double bass is closest in construction to violins, but has some notable similarities to the violone (literally "large viol")—the largest and lowest member of the viola da gamba family. 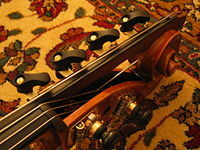 Unlike the violone, however, the fingerboard of the double bass is unfretted, and the double bass has fewer strings (the violone, like most viols, generally had six strings, although some specimens had five or four). Today, one can find, mostly in Europe, some composite material basses. Used a lot in music schools, or as traveling basses for example, they are very resistant to humidity and heat. Historically, strings were made of gut, but since the twentieth century, steel has largely replaced gut due to its better playability. Gut strings are nowadays mostly used by individual players who prefer their tone. Some bassists who perform in baroque ensembles use gut strings to get a lighter, "warmer" tone that is more appropriate for music composed in the 1600s and early 1700s. In addition, bassists in rockabilly, traditional blues bands, and bluegrass groups often use gut strings, because they produce a "thumpy," darker tone when they are played pizzicato (plucked), which better approximates the sound heard on 1940s and 1950s recordings. Rockabilly and bluegrass bassists also prefer gut because it is much easier to perform the "slapping" upright bass style (in which the strings are percussively slapped and clicked against the fingerboard) with gut strings than with steel strings. (For more information on slapping, see the sections below on Modern playing styles, Double bass in bluegrass music, Double bass in jazz, and Double bass in popular music). Gut strings are more vulnerable to changes of humidity and temperature, and they break much more easily than steel strings. The change from gut to steel has also affected the instrument's playing technique over the last hundred years, because playing with steel strings allows the strings to be set up closer to the fingerboard, and, additionally, steel strings can be played in higher positions on the lower strings and still produce clear tone. The classic nineteenth century Franz Simandl method does not utilize the low E string in higher positions because with older gut strings set up high over the fingerboard, the tone was not clear in these higher positions. With modern steel strings, bassists can play with clear tone in higher positions on the low E and A strings, particularly when modern lighter-gauge, lower-tension steel strings (e.g., Corelli/Savarez strings) are used. The double bass is generally tuned in fourths, in contrast to the other members of the orchestral string family, which are all tuned in fifths. This avoids too long a finger stretch (known as an "extension"). 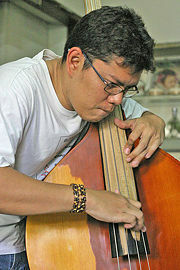 Modern double basses are usually tuned (low to high) E-A-D-G. The lowest string is tuned to E (the same pitch as the lowest E on a modern piano, approx 41 Hz), nearly 3 octaves below middle C ); and the highest string is tuned to G, an octave and a fourth below middle C (approx 98Hz). Professional bass players with four-string double basses sometimes have a low "C extension" which extends the lowest string down as far as low C, an octave below the lowest note on the cello (more rarely, this string may be tuned to a low B). The extension is an extra section of fingerboard mounted up over the head of the bass, which requires the player to reach back over the pegs to play, or use a mechanical lever system. Notes below low "E" appear regularly in double bass parts in the Baroque and Classical eras, when the double bass was typically doubling the cello part an octave below. Moreover, in the Romantic and the twentieth-century eras, composers such as Mahler and Prokofiev specifically requested notes below the low "E."
In many double bass concertos, harmonic tones are used. The use of natural harmonics (a technique often used by Giovanni Bottesini) and sometimes even "false" harmonics, where the thumb stops the note and the octave or other harmonic is activated by lightly touching the string at the relative node point, extend the double bass' range considerably. These two bows provide for different ways of moving the arm and distributing force on the strings. The French bow, because of the angle the hand holds the bow, is touted to be more maneuverable and provide the player with better control of the bow. The German bow is claimed to allow the player to apply more arm weight and thus more force on the strings. The differences between the two, however, are minute for a proficient player trained in using his/her respective bow. Both bows are used by modern players, and the choice between the two is a matter of personal preference. Pernambuco is regarded by many players as the best stick material, but due to its scarcity and expense, other materials are used in less expensive bows nowadays. 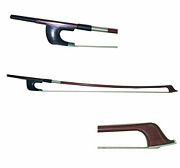 Less expensive student bows may be constructed of solid fiberglass, or of less valuable varieties of brazilwood. Snakewood and carbon fiber are also used in bows of a variety of different qualities. The frog of the double bass bow is usually made out of ebony, although Snakewood is used by some luthiers. The wire wrapping is gold or silver in quality bows, and the hair is usually horsehair. Some of the lowest-quality student bows feature synthetic fiberglass "hair." 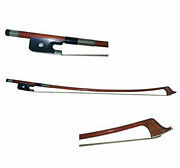 Double bass bows vary in length, but average around 24" (70 cm). Performing on the bass can be physically taxing because the strings of the bass are larger and thicker than those of a smaller stringed instrument. As well, since the bass is much larger than other stringed instruments, the space between notes on the fingerboard is larger. As a result, bass parts have relatively fewer fast passages, double stops, or large jumps in range. The increased use of playing techniques such as thumb position and modifications to the bass such as the use of lighter-gauge strings have reduced this problem to some degree. Until recently, the large size of the bass meant that children were not able to start the bass until their hand size and height would allow them to play a 3/4-size instrument (the most commonly-available size). In the 1990s and 2000s, smaller half, quarter, eighth and even sixteenth-sized instruments became more widely available, which meant that children could start at a younger age. Some teachers have been known to use cellos strung with bass guitar strings for extremely young students. It is also used in the genre of psychobilly. Some composers such as Richard Strauss assigned the double bass with daring parts and his symphonic poems and operas stretch the double bass to its limits. Some solo works have been written such as Mozart aria "Per questa bella mano" (By this beautiful hand), Ludwig von Köchel, for bass voice, double bass, and orchestra, featuring the double bass as an obbligato. "The Elephant" from Camille Saint-Saëns' The Carnival of the Animals is also a well known example of a double bass solo. The third movement of Gustav Mahler's 1st symphony features a solo for the double bass which quotes the children's song "Frere Jacques," transposed into a minor key. Sergei Prokofiev's "Lieutenant Kijé Suite" features an important double bass solo in the "Romance" movement. Later pieces with solo parts for the bass include a duo for cello and double bass by Gioacchino Rossini. Popular with bassists is Niccolò Paganini's Fantasy on a Theme by Rossini, a twentieth-century transcription of the violin original. Benjamin Britten's The Young Person's Guide to the Orchestra contains a prominent double bass solo. In addition to being a virtuoso player, Johannes Matthias Sperger was a very prolific composer and composed a large number of works for the double bass. Among his compositions include 18 double bass concertos, around 30 double bass sonatas, and string symphonies. Giovanni Bottesini, a nineteenth century virtuoso on the instrument, wrote a number of concert pieces for the instrument, including two concertos for the double bass and various chamber works for double bass and piano. Over the last 30 years or so players with solo careers such as Bertram Turetzky, Gary Karr, and James VanDemark have commissioned a large number of new works. Player and composer Edgar Meyer has written two concertos for solo double bass and a double concerto for double bass and cello for the instrument and had made arrangements of Bach's unaccompanied cello suites. Meyer also includes the double bass in the majority of his chamber music compositions. Player and teacher Rodney Slatford, via his company Yorke Edition, has published both old and new music for the double bass. Frank Proto, former bassist of the Cincinnati Symphony Orchestra, has published a large number of his own compositions as well as new editions of classic double bass repertoire via his company Liben Music. George Vance, noted teacher and author of "Progressive Repertoire for Double Bass," provides numerous publications from his company Slava Publishing. Norman Ludwin, bassist and composer, has published with his company Ludwin Music over three hundred pieces for the bass, including many original works as well as transcriptions. Other composers that have written for solo double bass include Christian Wolff, Iannis Xenakis, Salvatore Sciarrino, Hans Werner Henze, Emil Tabakov, Vincent Persichetti, Miloslav Gajdoš, Henrik Hellstenius, Hans Fryba, Ase Hedstrom, Tom Johnson, Arne Nordheim, Luis Jorge Gonzalez, Oliver Knussen, Giacinto Scelsi, Bezhad Ranjbaran, and Asmund Feidje. Free jazz was influenced by the composer/bassist Charles Mingus (who also contributed to hard bop) and Charlie Haden, best known for his work with Ornette Coleman. Beginning in the 1970s, some jazz bandleaders such as saxophonist Sonny Rollins and fusion bassist Jaco Pastorius began to substitute the electric bass guitar for the double bass. Apart from the jazz styles of jazz fusion and Latin-influenced jazz, the double bass is still widely used in jazz. Common rhythms in bluegrass bass playing involve (with some exceptions) plucking on beats 1 and 3 in 4/4 time; beats 1 and 2 in 2/4 time, and beats 1 and 3 and in 3/4 time (waltz time). Bluegrass bass lines are usually extremely simple, typically staying on the root and fifth of each chord throughout much of a song. There are two main exceptions to this "rule." Bluegrass bassists often do a diatonic "walkup" or "walkdown" in which they play every beat of a bar for one or two bars, typically when there is a prominent chord change. In addition, if a bass player is given a solo, they may play a walking bass line. In the 1940s, a new style of dance music called rhythm and blues developed, incorporating elements of the earlier styles of blues and swing. Louis Jordan, the first innovator of this style, featured a double bass in his group, the Tympany Five. The double bass remained an integral part of pop lineups throughout the 1950s, as the new genre of rock and roll was built largely upon the model of rhythm and blues, with strong elements also derived from jazz, country, and bluegrass. However, double bass players using their instruments in these contexts faced inherent problems. They were forced to compete with louder horn instruments (and later amplified electric guitars), making bass parts difficult to hear. The double bass is difficult to amplify in loud concert venue settings, because it can be prone to feedback "howls." The double bass is large and awkward to transport, which also created transportation problems for touring bands. ↑ Andrew Hugill with the Philharmonia Orchestra, The Orchestra: A User's Manual. Retrieved May 23, 2008. ↑ Alfred Planyavsky, Chamber Music in the Vienna Double Bass Archive.earlybass.com. Retrieved May 23, 2008. ↑ Jacob Head,The Double Bass.contrabas.com.Retrieved May 23, 2008. ↑ Paul Brun.A New History of the Double Bass. Retrieved May 23, 2008. ↑ Dennis Masuzzo,Taking the Fifth: How Tuning in Fifths Changed My Experience Playing the Double Bass. Retrieved May 23, 2008. ↑ Historic Jazz Fotos.peterunbehauen. Retrieved May 23, 2008. ↑ Stewart EvansHoward "Cedric Rainwater" Watts. Retrieved May 23, 2008. ↑ Dallas Bartley - Small town Boy: Playing in the bands, Special Collections and Archives Department, Southwest Missouri State University. Retrieved May 23, 2008. ↑ Monica M. Smith,The Electric Guitar: How We Got From Andrés Segovia To Kurt Cobain.Retrieved May 23, 2008. ↑ Rod Glaze.Marshall Lytle: Granddaddy of the Doghouse. Retrieved May 23, 2008. All links retrieved October 11, 2017. This page was last modified on 11 October 2017, at 19:58.